I attended last night's Public Works committee meeting for two items - the proposed hike in stormwater management fees and the budget. Among other agenda items, there was Prop 250, which looked to use some new gas tax money from the state, to float bonds to pay for infrastructure improvements. Gary Welsh over at Advance Indiana, and Jon Murray over at IndyStar, both did a good job relaying particulars. The late night newscast by WTHR, channel 13, however, did not do a good job. All they did was quote the Mayor's press release - which was so far beyond exaggeration as to be an outright lie. Here are the particulars from last night's debate on floating these bonds. The state is sending the City/County an additional amount of money from the gas tax revenue it receives. Lori Miser, head of DPW, and Deron Kintner, head of the bond bank/deputy mayor, said it was $7.8 million in new money. Hope Tribble, CFO for the Council, said it was $6.2 million. This is not guaranteed every year, although it appears that the State has committed to try to send it - if they can. The gas tax has been a hot topic in Washington for years now, as it is not as much of a revenue source for transportation as they would like. In either case, the proposal was to pay $9 million per year in debt service on new bonds. Depending upon the interest rate at the moment the bonds were floated, this could generate anywhere from $135 - $150 million. The bonds would be paid back over 30 years - so the taxpayers would spend $270 million over time to get maybe $150 million now. That computes to paying $120 million in interest and fees - nearly half. The City would add this $135 million to money it will spend on infrastructure anyway, to make a grand total of $350 million in spending over the next 3 years. Without bonding, they would have $242 million to spend over the next 3 years (I added the $9 million per year to the base $215 million). So, the City can still repave 'every one of our worst streets', and make 'our bridges safer'. The flooding issues I'll leave to another blog post. Suffice it to say, the City doesn't direct stormwater projects to the poorest neighborhoods in any case - they direct the money to flooded neighborhoods. DPW has been circulating a list of infrastructure projects that total between $500 and $600 million. Of course, any neighborhood looks to see if it's roads are listed. But that is clearly far more projects than can be done with the money - bond or no bond. So, the pivotal question was, is it fiscally sound to borrow additional funds using a shaky revenue source as collateral? The committee vote was along party lines - 5 to 2. The Democrats were fiscally responsible, choosing to avoid the situation where an unreliable stream of money from the State would be used to float bonds that would have to be repaid even if the State stops sending that extra. If the extra money continues to come in, well we and the next generation will have $270 million to spend on streets and sidewalks. I just don't understand why $242 million is somehow chump change to spend on infrastructure over the next 3 years, and why we have to continually reach into the pockets of the next generation to get what we want today - and wasting half of the money we steal from them on interest and fees, to boot. There should be no sin in patience, prudence, and protecting the next generation. There is, however, a sin in lying to the public. Shame on Mayor Ballard for lying and shame on WTHR for passing that lie along as the entire story to its viewers. Tonight the Admin & Finance committee of the City-County Council will consider eliminating the local homestead credit (again - Prop 274) and expanding the old Indianapolis Police District taxing district (Prop 275) from basically the old city limits to the entire county minus the excluded cities. The local homestead credit is applied to homestead property tax bills. The money used to supply the credit comes from local income taxes. It costs more in income tax money than it saves taxpayers in property taxes, because so many property taxpayers have already hit the tax caps and can be billed no more than the 1% value of their homes. 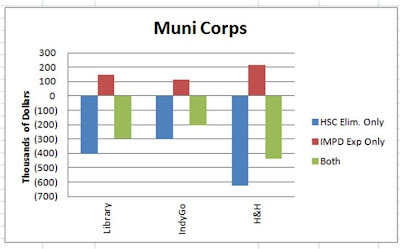 I'll give you graphs and numbers below, but suffice it to say without numbers, that the City/County government stands to reap millions of dollars and those Townships that retain their fire departments stand to gain in tens to hundreds of thousand dollars if the homestead credit is eliminated. The remaining Townships, the School Districts, and three municipal corporations (IndyGo, the Library, and Health & Hospitals) all stand to lose anywhere from $50,000 to nearly $1 million if the homestead credit is eliminated. The expansion of the old IPD taxing district would still collect the same total amount of money - but more property taxpayers would pay a share. Therefore the tax rate in the old city limits would go down and the tax rate outside would go up. Through the magic of the property tax caps, this would cause the City/County to again reap millions more from this change, IPS would see millions more, and Center Township along with the three municipal corporations would see hundreds of thousands more in revenue. All other Townships and School Districts would see a drop in revenues from minimal to just over $700,000. If you do both - eliminate the homestead credit and expand the IPD taxing district - you get a mixed bag of effects because the list of winners changes with the two. The administration is basically holding forth the notion that those who stand to lose revenue through these changes, will make up for the losses because other revenue they get is scheduled to increase and would absorb most, if not all, of any losses. This ignores two facts - one is that the School Districts have already signed teacher contracts obligating them through June of next year. These contracts were crafted in anticipation of the increased revenues. The other fact is that the City/County will also see an increase in revenues and can, using the same logic, forgo both the homestead credit elimination and the expansion of the IPD tax district. 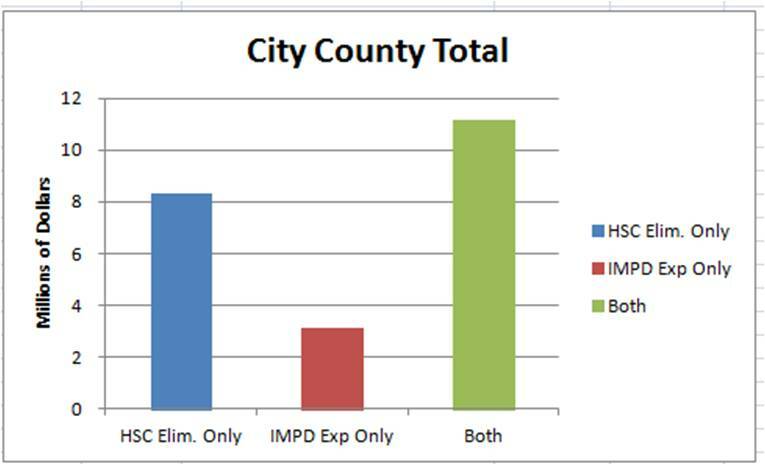 Below are some charts showing the impact of eliminating the homestead credit, expanding the IPD tax district, and doing both, on most of the taxing districts in Marion County. I have uploaded the raw data supplied by Jason Dudich, the City Controller, to Google Drive (here and here) should you want to look over those districts I've not followed below. The data for the elimination of the homestead credit is from the Policy Analytics presentation to the Review Commission. The City clearly finds advantage in any combination of changes. It is the big winner. Center Township and the westside Townships see the real 'action'. Center gains if the tax rate in the old city limits goes down, by reducing the number of taxpayers who are at the property tax caps - thereby increasing the amount of property tax revenue that becomes collectable. The westside Townships are the only three that retain their fire departments. They receive income tax revenues and thereby gain when income tax money is freed up by the elimination of the homestead credit. They lose, however, property tax revenue if the old IPD tax district is expanded, because the tax rate will go up in their district and more folks will hit the tax caps - decreasing the amount of collectable tax revenue. 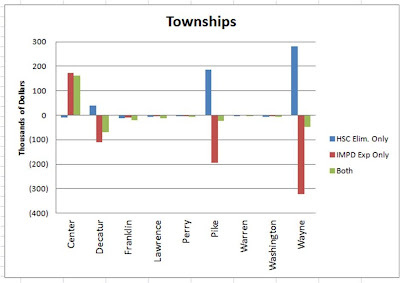 The least difference for these Townships is if both the elimination and the expansion move forward, or if neither is enacted. 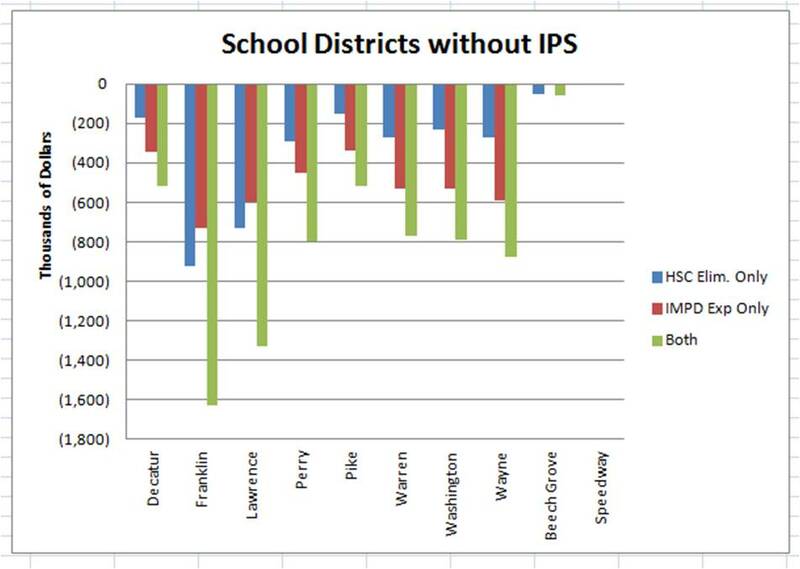 I show the school districts with and without IPS, as that district's gain dwarfs the losses of any one of the other districts. 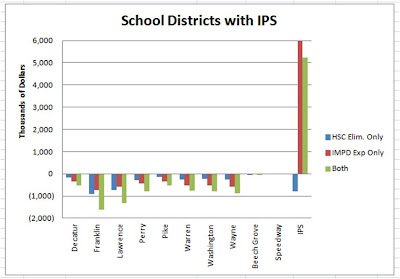 IPS gains only with the expansion of the IPD tax district. The other school districts lose any way you cut it. 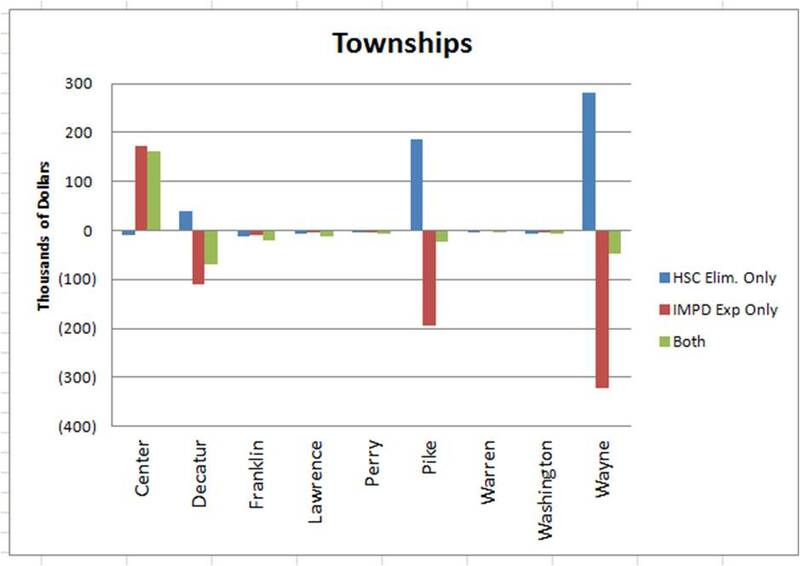 Beech Grove and Speedway have the lowest property tax dependence and thus the lowest impact from any proposed changes. Last but not least is the impact of the elimination and expansion on the Library, IndyGo, and Health & Hospitals. These three depend upon both property tax and income tax revenues, but mostly the former. They lose money if the homestead credit is eliminated and gain if only the IPD tax district is expanded. 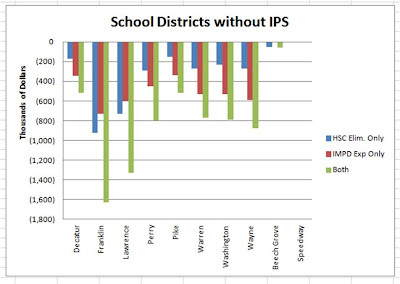 There is no threading the needle here; if any changes are made, some taxing district will lose and some other will win. Clearly these proposed changes are being proposed only because they increase the revenue to the City/County government no matter what combination is enacted. But, the impact and fallout from changing the status quo is quite real. The elimination of the homestead credit has had time for its impacts to be considered and weighed. 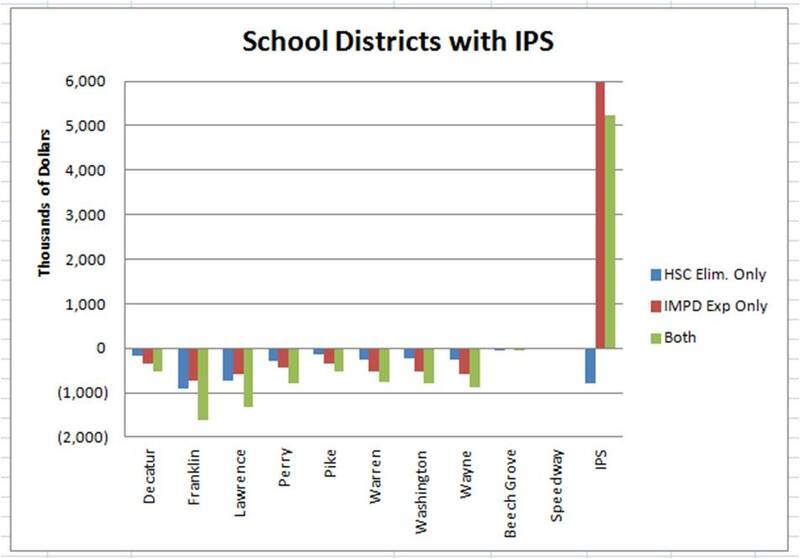 The full impact of the expansion of the IPD district and the full impact of the combination of changes, have not been granted the same study. That will be unfortunate, to say the least, should any Councillor vote on these matters without reviewing the exact impacts for themselves. The proposal to increase the City's Stormwater management fee (which appears on property tax bills), is scheduled to be considered by the City-County Council's Public Works committee this Thursday, August 26. The meeting begins at 5:30 pm and is held in room 260 of the City-County Building. DPW expects to make 40% more from the fee than they currently collect, by changing the way the fee is calculated and how much is charged per square foot of impervious surface on the property. There is also a stipulation for an automatic annual rate increase to the fee going forward. This Tuesday evening, August 27, the Admin & Finance committee of the City-County Council will consider Props 274 and 275. Prop 274 would eliminate the local homestead credit on property tax bills, while Prop 275 would expand the old Indianapolis Police Department tax district from the old city limits to the entire Unigov city limits (entire county minus the excluded cities). There will be another public hearing on Prop 274 at the September 9 full Council meeting. If you want to attend either, the committee meeting on Tuesday begins at 5:30 pm in room 260 of the City-County Building and the full Council meets in the Public Assembly room, 2nd floor of the City-County Building, beginning at 7 pm. Chair of the Admin & Finance committee, Angela Mansfield, confirms they anticipate taking testimony and voting on both proposals on Tuesday. My friend Jon Easter penned a thoughtful piece over at Indy Democrat Blog, about the coup attempt by Councillor Brian Mahern at Monday night's Council meeting. Lot's of comments. Mahern began this term as Vice President of the Council. I understand he ruffled feathers and some Councillors felt he did not play well with others. What he did do, is what he has consistently done. Stood on the side of good public policy and government expenditures that benefit the public. He is a true believer and the real deal. It was clear to all that he was looking to run for Mayor. However, the powers that be could not continue to ride the gravy train if that were to occur. The usual suspects didn't contribute to his coffers because it would not get them the coziness they can buy with contributions to other politicians of both parties. He stopped running. The Council leadership and their power brokers didn't like all that talk about being sensible with TIFs - nor, for completeness sake, do the Council minority leadership and their power brokers. The Ds stripped Mahern of his Chairmanship, of his VP position - and just last week they stripped him of even serving on the coveted Rules committee. I would not be surprised to have confirmed, that once the State removed At-Large positions from the Council, the County Party decided that At-Large Councillor, Zach Adamson, would win the Slating contest for the local district held by Mahern - such is the integrity of the slating process and all. But, the Ds should worry about continuing their harsh ways. Mahern could do an Evans and switch party allegiance to the Rs. What would he lose? That one seat would swing the Council to an R majority. They could cut millions from all Democrat-elected County office budgets - with abandon. They could re-re-redistrict the Council seats and end the chance that the State Supreme Court would redraw the maps as they did a decade ago. They could eliminate the homestead credit. They could redraw the old IPD tax district. They could increase the COIT and PST income tax rates to max. They could reassign all members of standing committees of the Council, and taking the D lead, assign a lone D to each one. Just for fun, they could assign Mahern to all the really nifty committees. They could create as many new TIF districts in Republican held Council districts as they wanted. They could continue to snub D Councillors and still not invite them to ribbon cutting ceremonies when key projects are commenced in a Democrat held Council district. The Mayor's office could go back to ignoring them. My god, they could even switch the side of the room they sit in. Clearly, Maggie Lewis would not remain Council President if the Rs gained the majority. Yup. A little strategy might be a good thing here. Shifting the fallout from too many TIFs, is not fixing the problem - and it is NOT fair. 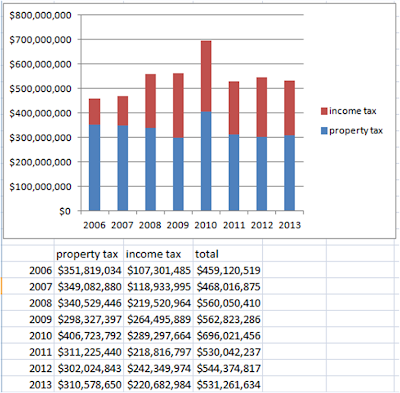 TIFs are syphoning off roughly 15% of all property taxes - and will do so in some cases FOREVER. Two years ago, TIFs caused half of the circuit breaker penalties which limit how much property tax revenue taxing units can actually receive. We are approaching the point where, for every tax dollar captured by TIFs, a dollar will be taken from the taxing units that provide needed services with those revenues. There is currently a barrage of tax and fee increases being proposed, as well as a proposal to float 30 year bonds with new gas tax money provided to Indy by the State. Let's look at them one by one - as there is a pattern here. The ongoing effort to eliminate the local homestead credit has, for the moment, been denied by the Council. 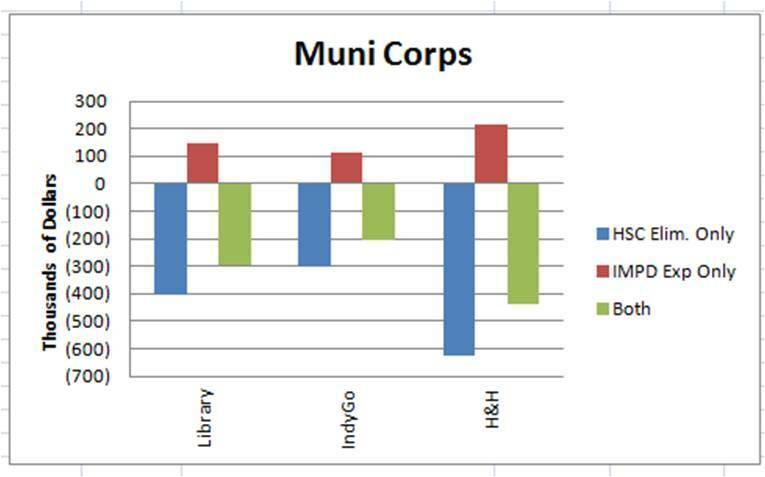 Put simply, if the local homestead credit is eliminated, the City gets more money, but most others lose tax revenues - most notably the various school districts. It is a zero sum game. The Mayor wants to shift the fallout from his coffers to other units of government. The local homestead credit is now being repurposed and packaged with the fact that those property owners within the old Indianapolis Police Department footprint are paying an additional 0.3486 tax rate that the rest of us do not. (see excellent article by IndyStar's Jon Murray) This additional tax rate is calculated to bring in $35.3 million this year, minus the circuit breaker penalties caused by TIFs and too much debt. Now, this is about one tenth of the total tax rate paid by most taxpayers. When IPD and the Sheriff's Department were resorted/merged, this tax footprint was not reconfigured to the entire IMPD district; likely because it is a tax increase and may have scuttled the merger. The marketing folks have decided to market this proposed reconfiguration as 'only fair'. While there is a grain of truth to that, implementing this change will induce another 'unfair' reaction. If the IPD tax is spread Countywide, the $35 million would be pulled from more peoples pockets - lowering the amount paid by those in the IPD district, and increasing the amount paid by those outside the IPD district. The tax rate inside the IPD district would drop, and the number of property owners hitting the tax caps would drop as well. The tax rate outside the IPD district would increase, and the number of property owners hitting the tax caps would increase. To avoid getting too far into the weeds, and simply put, the City and IPS would see a rise in the property tax revenue they collect, while the Townships and Township School Districts would see a loss in property tax revenues they collect. It is a zero sum game. It is simply a shift of tax revenues from the areas outside the old city limits to those within the old city limits. Now, personally, I could find my way to support this shift IF the City passed an ordinance tying the creation of any new TIFs to the retirement of old ones - a step in the right direction of actually fixing the negative effects of capturing too much property in TIF slush funds. There is also a proposal to increase the stormwater management fee that appears on your property tax bill, but is a so-called 'user fee' rather than a tax. There are too many facets to this proposal to go into all of them right now. Again, simply put, the marketing arm of the City has decided a winning pitch is to cast this current configuration of this fee as 'unfair'. The contend that residential property owners pay a fixed $2.25 per month ($27 per year), while non-residential property pays by the amount of stormwater-impervious surface on the property. The proposal would increase the amount collected by 40%, and change all property to pay $1.10 per month for each 1000 square foot of stormwater-impervious surface. It would be only by 1000 square foot increments - so if you had 1001 square feet, you'd pay $2.20 per month. Gravel drives are considered impervious surface for this fee calculation, by the way. All this begs the question - what happened to the $20 million a year they already collect for stormwater management projects? Well, the first $10 million per year from the initial fee in 2002, did not go to any new projects, but was assigned to paying back old bonds floated for anything attributable to stormwater - freeing up money for projects having nothing to do with stormwater. Most of the second $10 million per year, from the 2006 fee increase, has been consumed by the practice of floating bonds for projects, rather than paying as you go. This caused about a third of the fee dollars to be flushed down the toilet in paying bankers, bond salesmen, and interest. Additionally, the City has also stopped using any other funds to pay to operate the stormwater system - about $4.5 million per year. By not paying as you go, the City has yet again reached into your childrens' purses to pay for your stuff today. Sure, it helps get politicians reelected, but it is not prudent fiscal policy. If they had been prudent, we'd have $20 million a year for projects and stormwater problems countywide could have been resolved within 10-15 years (they said the need was $246 million in improvements in 2001). Instead, they floated 30 year bonds and wasted a third of the money for 30 years. Have they learned their lesson? Nope. The already plan, should the fee increase be granted, to float at least 7 bonds which will consume 60% of the fee and leave only 40% for pay as you go projects. Who knows what the fate of the 40% will be when the next Mayor seeks re-election. The last item I want to put into today's hopper is the proposal to float a $135 m bond for streets and sidewalks using the additional $7 million in gas tax proceeds the State has decided to share with the City. Here's the math. $7 million over 30 years is $210 million, but the bond would only generate $135 million. That's $75 million flushed down the toilet to pay bankers, bond salesmen and interest. Again, spending $135 million on sidewalks sounds good in a 10 second reelection campaign ad, but it is bad fiscal policy to do it this way. Putting too much property value in TIF districts, has consequences. Floating bonds unnecessarily, has consequences. Shifting the fallout from these bad practices is NOT fixing the problem. It merely makes life easier for the current City elected officials and their buddies. This City continues to create TIF districts, the effect of which is to reduce property tax revenue for basic services - like police, fire, and schools. City leaders continue to float bonds that rob the next generation, instead of paying as you go. They figure that the lack of services and a good marketing pitch will get you to dig deeper in your pocket. There's a sucker born every minute, as PT Barnum used to say. Guess who our City leaders think the suckers are? Which is Better for Indy's Tourism - Inflation or the CIB? The 2012 Annual Report of the Capital Improvement Board is posted on their website. In the latter portion of the Report, the CIB lists the preceding 10 year history of a number of items - from tax revenues, operating revenues and expenses, as well as number of events and attendance numbers. As you know, the CIB is responsible for the Indiana Convention Center, Lucas Oil Stadium, Banker's Life Fieldhouse, and Victory Field, as well as some other parking properties. They take in tax revenues from the Innkeepers, Food & Beverage, Car Rental, and Ticket sales at their venues. There is also a "Professional Sports Development Area" designated downtown, where all of the State Sales and Use Taxes, State and Local Income Taxes, and the F&B Taxes go to the CIB. Furthermore, the MDC gives the CIB $8 million of property tax revenues from the consolidated downtown TIF each year. In looking over the table of tax revenues, it dawned on me that one could determine the size of a variety of entertainment/tourism market segments from the taxes recovered from those market segments. For instance, the CIB takes in the revenue from a 1% F&B tax, imposed on all food and beverage outlets in Marion County. Simply multiplying that tax revenue by 100 gives the size of the MC F&B market segment. Similarly, if one uses 2003 (the first of the 10 year data noted) as the starting point, one can calculate the growth of any of these market segments over the decade. Again, for instance, if one divides each year's F&B tax revenue by the amount the CIB got in 2013, one would have the growth in the MC F&B market segment over time. All of these can be compared to the rate of inflation, to ask the question, has the CIB helped grow the entertainment/tourism market more than inflation has? 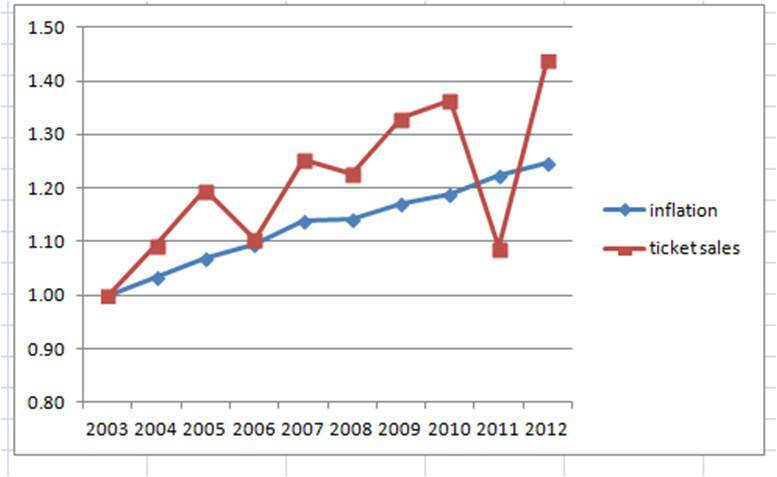 The revenue captured by the CIB from the original PSDA footprint was $6.45 m in 2003, and grew to $7.27 m by 2012. 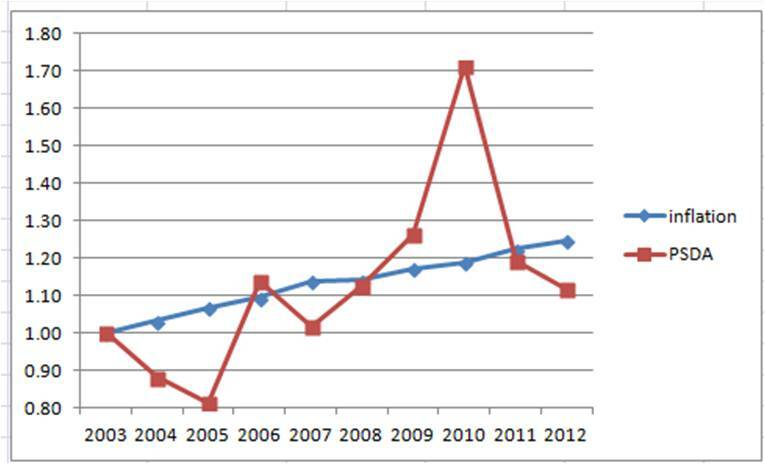 All revenue numbers from 2004-2012 were divided by the $6.45 m figure from 2003 to generate the red line in this graph. 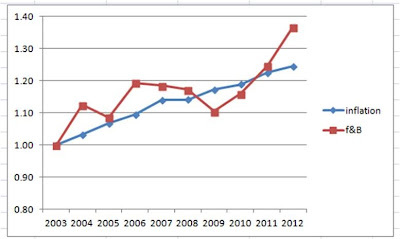 The blue line is the growth in inflation. 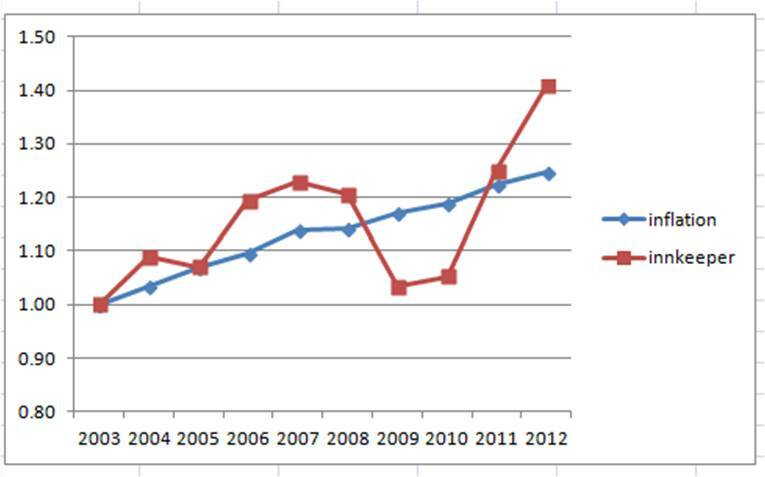 Of note is the fact that in mid-2005, the MC F&B tax doubled, and in 2008 the State Sales Tax went up from 6 to 7% and the Local Income Tax went from 1 to 1.65%; thus increasing the expected revenue to the CIB from this area. Of course, the Great Recession struck in 2008. In 2012, the City hosted the Superbowl. If the CIB is to have an effect, one would most expect an increase in the PSDA, which is the footprint of the buildings owned by the CIB and nearby hotels. One is hard pressed to see any particular effect on the original PSDA besides inflation and random bounce. 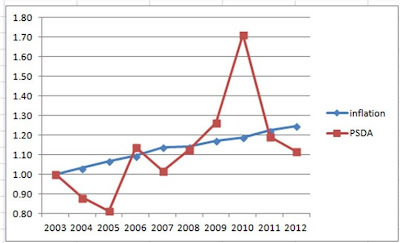 The revenue captured by the CIB from the original ticket tax was $4.54 m in 2003, and grew to $6.5 m by 2012.﻿ The red line is growth from the ticket sales market segment. 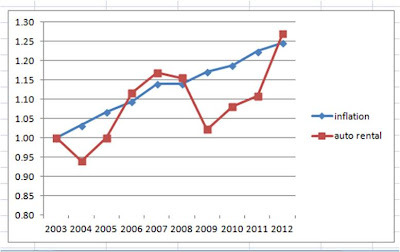 The blue line is the growth in inflation. Of note is that Lucas Oil Stadium opened in 2008. Also, the Great Recession struck in 2008 and the City hosted the Superbowl in 2012. There would seem to be some indication of an early increase in these sales beyond inflation, followed by a slightly greater than inflation growth in the admissions tax revenue - but I do not have any numbers to indicate if ticket prices rose faster than inflation, or if the number of tickets sold increased. As with the PSDA, one would expect any effect of the CIB to show up in its own facilities first and foremost. The revenue captured by the CIB from the original auto rental tax was $1.85 m in 2003, and grew to $2.35 m by 2012. The red line is the growth in the car rental market segment. The blue line is growth in inflation. Of note is that the Great Recession struck in 2008 and the City hosted the Superbowl in 2012. The airport opened its new terminal in 2008, along with new car rental facilities. The CIB, and those who supported the recent hike in the auto rental tax, keep telling us that only visitors pay for rental cars. There is not strong evidence that the car rental business has improved much beyond inflation over this decade. The revenue captured by the CIB from the original 1% tax on food and beverage sales in Marion County was $15.62 m in 2003, and grew to $21.36 m by 2012. 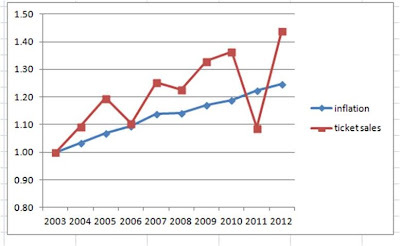 The red line is the growth in the Marion County F&B market segment. The blue line is growth in inflation. Of note is that the Great Recession struck in 2008 and the City hosted the Superbowl in 2012. Once again, inflation bounce could easily account for the 10 year growth in the F&B market segment. We will have to see what 2013 and beyond bring, if we are to decide if the 2012 increase is Superbowl bounce or a sustained increase. 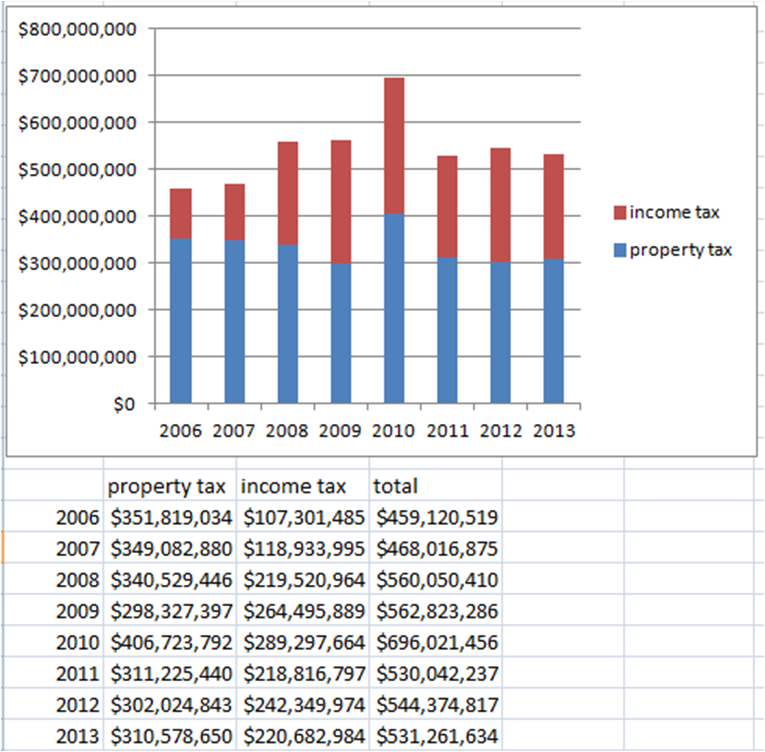 The revenue captured by the CIB from the original 1% innkeeper's tax was $3.21 m in 2003, and grew to $4.52 m by 2012. The red line is the growth in the Marion County Hotel market segment. The blue line is growth in inflation. Of note is that the Conrad Hotel opened in 2006 and the JW Marriott in 2011. Also, the Great Recession struck in 2008 and the City hosted the Superbowl in 2012. Any growth in the hotel market segment appears to bounce around inflation. Again, we will have to see future years' numbers in order to interpret the 2012 number as being caused by the Superbowl or by sustainable growth. 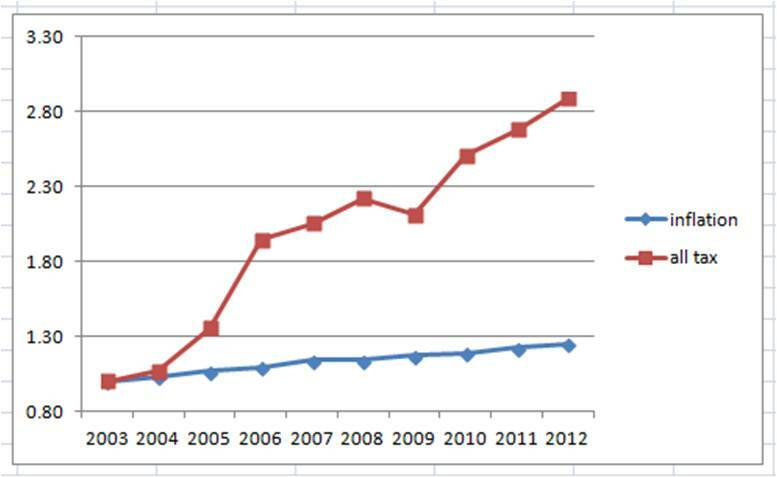 The total tax revenue received by the CIB was $48.07 m in 2003, and grew to $138.78 m by 2013. 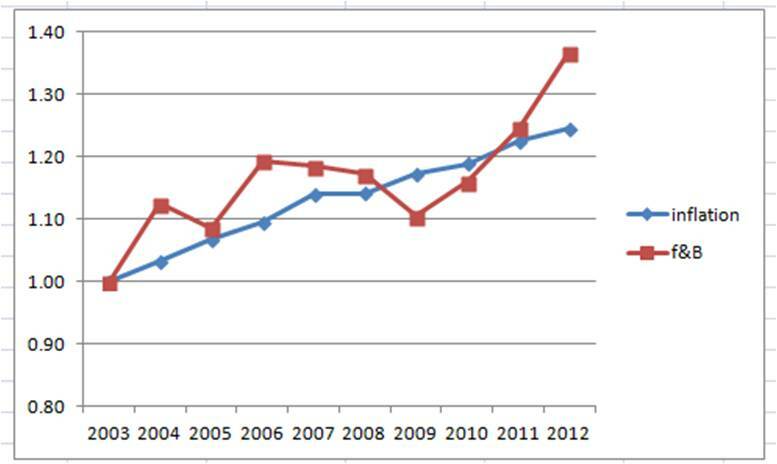 The red line is growth in all tax revenue. 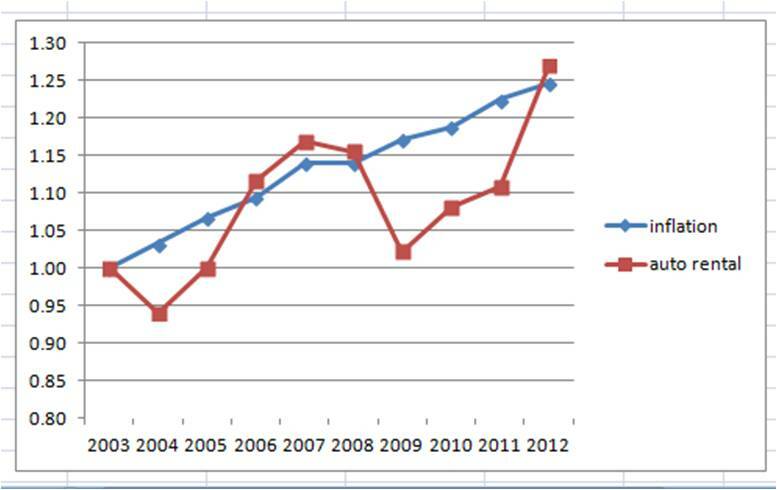 The blue line is the growth in inflation. There is little evidence that the growth in the entertainment/tourism market segments touted as being enriched by the activities of the CIB is anything but due to inflation, and perhaps the Superbowl. That is reflected in the fact that the initial taxes levied for the CIB were not growing well enough to support the ambitions of the CIB. Thus, additional tax hikes were implemented and other sources of cash were found. 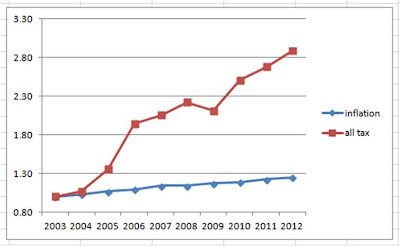 The footprint PSDA was expanded twice in the decade from 2003 to 2012; the Admissions Tax was increased once; the Auto Rental Tax was increased once; the F&B Tax was increased once; the Innkeeper's Tax was increased twice; and the MDC began gifting the CIB. Just this year, the Admissions Tax and Auto Rental Tax were increased yet again. The two $9 m loans from the State to the CIB are not included in these numbers. Bottom line - inflation accounts for nearly all, if not all, of the growth in several entertainment/tourism market segments in recent years. The only thing growing beyond inflation is the amount of taxes being levied to feed the CIB. What can you say about the Ballard Administration's request to drop the local Homestead Credit (increasing taxes on most property owners and foisting higher circuit breaker penalties on schools, IndyGo, and the Library system), increase County Option Income Taxes, and a new proposal to increase the stormwater drainage fee to property owners - when Ballard's combined property and income tax revenues have been $70 million, $100 million, and more, than Peterson enjoyed in his last two years in office? Why, you have to wonder where it all went. The spate of proposed tax and fee increases sent me to City budget documents to pull out the property tax and income tax revenues enjoyed by the City/County government from 2006 through 2013. These numbers are 2006 actual, 2007 actual, 2008 actual, 2009 actual, 2010 actual, 2011 expected from the adopted budget, 2012 expected from the introduced budget, and 2013 expected from the adopted budget. Circuit breaker penalties began in 2011 and are reflected in the revenue numbers listed below. In 2012, the State returned $46.6 million in additional income tax revenue to the City, for errors in 2011 and 2012 - this windfall is accounted for in 2012, as that is when it was received. 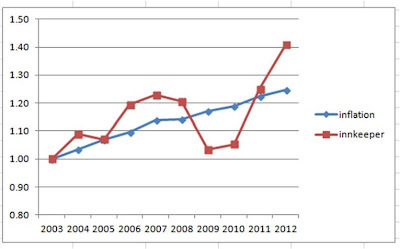 Peterson's last two years in office were 2006 and 2007. He increase the income tax by instituting a Local Option Income Tax (to reduce, somewhat, property taxes) and a Public Safety Tax, with the expectation that he would hire 100 additional police officers and handle the ever-growing pension obligation. So, he handed Ballard an enriched budget. In fact Ballard has enjoyed combined property and income tax revenues $70 million to $100 million more than his predecessor. In 2010, I do not know what happened, but there was an additional windfall of about $150 million. One also has to note that in 2009, the State took over a number of expense obligations; the aforementioned pension being one, and a $100 million annual obligation for the Family and Children's Fund that was supported by property taxes, being another. The new City Controller, Jason Dudich, anticipates an additional $20 million in tax revenues for 2014. The City is also just sitting on $80 million in a 'stabilization fund', that could help us eke by with 'only' $20 million more. The revenue impact from tax caps, much focused on by the Ballard Administration, was easily compensated for by Peterson's income tax increases. So, where did the money go? And, why can't the City handle its current budget obligations with $100 million more in revenue, and fewer obligations, than Peterson had? You could see this coming for a couple of years. Mayor Vaughn is the latest faux mayor of Indianapolis to walk the City's finances and talking points toward yet another tax increase, purportedly to finance public safety - again. IBJ's Kathleen McLaughlin has it inked down in today's issue. Clearly, they have used the belt-tightening brought on by the recession to focus on public safety because an scared public is more willing to accept a tax increase. The Mayor's budget failed to allocate funds for a police recruit class this year (a firefighter recruit class eventually was established with federal grant money). The Council Democrats, with Councillors Mahern and Brown taking the lead, found a way to fund those recruit classes, but those efforts were vetoed by the Mayor. Preceding the recession was former Mayor Peterson's public safety tax (which ushered Ballard into office) and the State Legislature's takeover of some of our City's largest fiscal responsibilities, including the pre-1970 police pension that Mayor Goldsmith failed to fully fund. The first years of the recession brought a bounty of cash infusion from the federal government; so much so that our total budget numbers increased. We have had a year or two of actual declining budgets - with the gap being filled by the City finding legal ways to pilfer tax dollars sitting in the consolidated downtown TIF. That maneuver, however, crimps the amount of cash in the slush fund that is used to give taxpayer money away to well connected developers. With the economy improving, property tax and income tax revenues are once again on the rise. The opportunity to 'fix' a temporary problem with a permanent tax increase has just a short window of time before revenues improve too much to sell 'impoverishment' to the public. For folks like Vaughn and former Councillor turned Public Library leader, Jackie Nytes (who never passed up an opportunity to raise more revenue for our fair City), time is of the essence. Our new City Controller, Jason Dudich, presented information about our tax revenues to the Homestead Credit Commission. Check out page 3 of his PowerPoint. By 2014, income tax revenue will be back to 2008 levels - without some of the spending needs that were taken over by the State. And, as McLaughlin's article points out, the State is holding back some of the income tax revenue, as it always does, to provide a more constant, more predictable, stream of funds. Lets face it - Vaughn and Nytes have to secure public backing for raising taxes AND secure a tax increase quickly. Curiously, McLaughlin points to the Marion County Income Tax Council, which is controlled by the Council, as a body legally able to raise local income taxes from the current 0.35% to 0.5%. She also reports that they can increase the COIT tax that flows to various taxing units including the City, the County, and three of our municipal corporations - namely the Library, IndyGo and Health & Hospitals - from 0.27 to 0.35. This caught me by surprise, as I had incorrectly assumed that any tax increase necessarily was already maxed out and new permission was needed from the Legislature. In a quick look at the Indiana Code 6-3.5-6 - the MCITC must meet by August 1 in every odd numbered year and may only pass one tax resolution in a year. We'll have to find out what the status of their meetings in 2013 is and what measures have already been taken. But, it now appears that this year's budget season will include an income tax hike crafted around the diminishing numbers of public safety personnel - even though recruit classes could have been funded but were vetoed by the Mayor, and even though tax revenues are once again on the rise due to the improving economy.